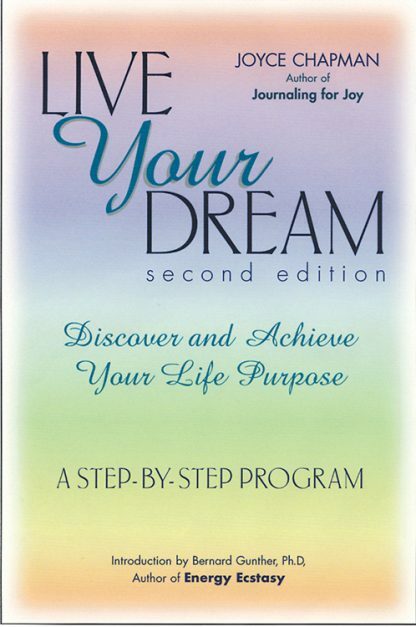 The purpose of this book is to assist you in actively being the person you want to be, and acquiring the tools and mastering the skills necessary to achieve your ultimate potential. Joyce Chapman wants you to take charge of your life and change it! Based on her successful workshop series and home study programs, this book challenges you to reclaim and re-energize your life. The step-by-step program will help you recognize your belief systems, overcome internal obstacles and reclaim the daily joy of every day life. Called "a manual for life", this is a commanding and empowering book that invites you to reclaim your life and dreams and embrace joyfulness each day. By applying Joyce's interactive techniques to your daily life, you will discover a new joy of living and renewed sense of self and purpose-and become an actualized dreamer. Before founding her company, Live Your Dream, Joyce Chapman, B.A., M.A., was an educator for 21 years. Now an internationally known author, speaker, coach, and consultant, Joyce's books: Live Your Dream, The Live Your Dream Workbook, Journaling For Joy, Journaling For Joy: The Workbook, Celebrate Your Dream, Celebrate Your Dream Workbook, and her Notice! series are used by both individuals and companies to discover, embrace and achieve goals and objectives. Joyce understands the need to nurture and empower people to recognize and grasp the dreams within them, while at the same time giving them the tools to do so. Throughout the year Joyce speaks, coaches and offers workshops to a variety of audiences -- each with a focus on the natural joy that resides in each of us. Whether through journaling and its ability to open us to self-discovery or practical exercises in breaking out of the traditional roles we set for ourselves -- Joyce is a master coach who believes that "... the facilitator's role is to inspire each participant with a passion for learning to live the life of their dreams!" And it is with this in mind that Joyce Chapman guides individuals to achieving their dreams. To discover your passion and make it happen.